The DC-9 was intended specifically to work from short runways and on short- to medium-range routes in order for the speed, comfort and reliability of jet transportation could be lengthen to hundreds of communities formerly served only by propeller-driven airliners. It is smaller than the DC-8 version. Manufacturing of this aircraft is in Long Beach, California which is now the Division of Boeing Commercial Airplanes. 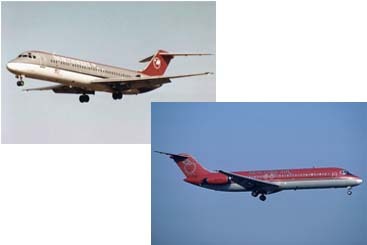 There are 5 primary DC-9 versions, designated These are the Series 10, Series 20, Series 30, Series 40 and Series 50.